Calm skin after shaving with NAOBAY's Energetic After Shave Balm for Men; a non-greasy balm to instantly cool and soothe redness and irritation caused by your razor. Utilising refreshing extracts of Peppermint, Aloe Vera and Ginkgo, its invigorating formula provides anti-inflammatory benefits to restore long-lasting comfort, whilst reinforcing the skin's natural protective barrier to leave your complexion revitalised and hydrated. 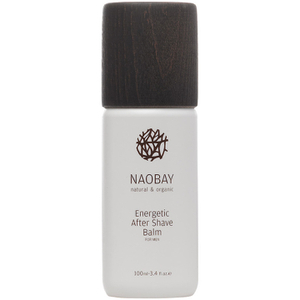 Eliminates tightness and replenishes moisture to reveal soft, smooth skin. 99.45% of the total ingredients are of natural origin. Aqua, Aloe Barbadensis Leaf Juice*, Caprylic/Capric Triglyceride, Alcohol Denat, Propanediol, Decyl Cocoate, Butyrospermum Parkii Butter*, Methyl Glucose Sesquistearate, Stearyl Alcohol, Glycerin, Simmondsia Chinensis Seed Oil*, Persea Gratissima Oil*, Olea Europaea Fruit Oil*, Lycium Barbarum Fruit Extract*, Ginkgo Biloba Leaf Extract*, Mentha Piperita Leaf Extract*, Benzyl Alcohol, Dehydroacetic Acid, Potassium Sorbate, Sodium Benzoate, Parfum, Citric Acid, Xanthan Gum, Citral, D-Limonene, Farnesol, Geraniol, Linalool. * Ingredients from organic farming.